The Ace of Pentacles is the first card in the suit of Pentacles. A largely positive card, you should expect good things to happen when you see it. Pentacles represent material possessions and wealth. 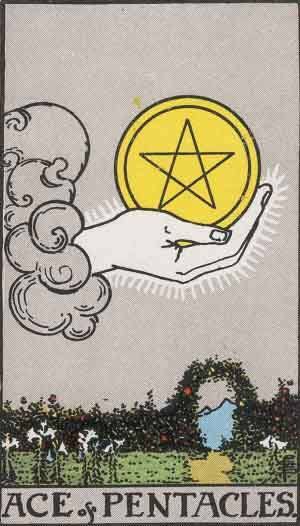 Pentacles in tarot are also sometimes called Coins. The pentacle itself is a well known symbol with many meanings and interpretations in many faiths, notably Wicca. The Ace of pentacles is well regarded as a favourable card to receive in a reading. The Ace of Pentacles represents material abundance, improving finances and good luck. Past – The Ace of Pentacles in the Past position can represent coming from a privileged background. A well cared for childhood, for example, or something more recent. Maybe you’ve set yourself up very well and prepared for what is coming. You could recently have started a new life, perhaps you have just moved somewhere. It has been a very positive move in any case, and you should see the benefits soon. Present – The Ace of Pentacles in the present position means life is fine and well in a material sense. You are not wanting for more possessions. Things are going to go well for the foreseeable near future. Don’t panic or worry if anything bad has just happened, treat it as a learning experience. The Ace of Pentacles presents our life on a plateau. You should be looking to where you can help others, as at the moment, you’re entering a high point of your life. Future – The Ace of Pentacles in the future position represents a material goal that will be achieved. A new house, car or similar. Imagine yourself climbing a mountain, there is a struggle but so long as you continue upwards you will reach the reward. People often say it as a joke, but you only fail if you give up. Persistence is key. The Ace of Pentacles is a great card to receive in a future position; as it resonates such happiness, you know that one day you will somehow ‘make it’ and feel fulfilled and achieved. Work / Education – The Ace of Pentacles in regards to work or education means continued success and steady growth. You might land that job you always wanted, or possibly move a step towards that path. If you are still in education, look to start a new extracurricular activity. Not only will this affect your work ethic as a whole, but you’ll also understand the entire subject so much more. With the wealth aspect, a promotion is something to consider chasing after. If you work for yourself, this is an especially good sign; expect something out of the blue to spur your business forwards, possibly some lucrative contract or new connection. Romance – The Ace of Pentacles in romance is a very good sign. Many things that happen in a relationship seem like a big deal at the time, but when you really think over it, it’s nothing to be concerned about. Don’t blow things out of proportion. If you’ve been saving up, it might be time to cash in the potentiality of that money for a real-world experience. Money in the bank is just a number, but it can be so much more. Surprise your partner with a romantic gesture, possibly a short trip away. If you are single, the Ace suggests as new start, so keep your eyes open for any future love interests, especially if you have started a new workplace. Friends – The Ace of Pentacles in regards to friendship means things are going well. Don’t expect any arguments or gossip now or in the near future. It might be a good time to treat your friends to something they’ve wanted, especially if they’re close to you. It’s likely you’ll make a new friend; look for people you work with, especially if somebody has just started and needs some connections. Don’t be afraid to reach out. Money – The Ace of Pentacles in regards to finances is another great, positive sign. Are you looking for work or have things taken a bad turn? The Ace of Pentacles is a good sign, a new leaf that you are meant to turn over. Don’t be stingy, but be careful as always. Health – The Ace of Pentacles is good when placed for health. Expect recovery and thought as clear as water. The aspect of money might indicate that you’ll need to spend some to get the real gains. Join a gym, or an exercise program, like yoga for example. Spirituality and Mentality – The Ace of Pentacles in spirituality means that now might be a good time to help and inspire others. You might have everything you need to help others. You have to look at what you have and what others are lacking and address the balance. In reverse, the Ace of Pentacles can suggest the negative aspects of wealth. You could be worrying too much about things not going to plan, and it’s possible that you are having issues with your funds at the moment. You might also be scared to go out and try to make things better for yourself. This is normal, sometimes we settle for the bare minimum and think ‘this will do’, but that isn’t the right mentality to have. Sloth, a capital sin, can take over our lives if we let it. You have to keep pushing in order to break yourself free. 1 represents the beginning, creation and initial ideas. All aces symbolise this. The Ace of Pentacles strongly shows that you are setting into motion events that will benefit you in this world. You may have a new business idea, or you’ve recently changed your lifestyle to increase material abundance. If you have many Aces in a reading, it is a strong indication that you are at the start of a new part of your life. We’ve selected live tarot readers to give you a FREE 3 Minute interpretation of The Ace of Pentacles! Scroll through them below and pick your favorite one.